" Yes, Yes boys we know we look good bit let&apos;s get in the pool!" Alya told the boys in a sassy manner. I looked at Nino who, like Adrien walking at his girlfriend.
" S-sorry " Nino stutterd. Adrien came up to me I looked at him. Then he grabbed my waist and pulled me in for a kiss. "Get a janitors closet" Nino yelled at us. Adrien pulled away from me and I blushed. He tried to get another kiss but I ran away from him and ran straight for the pool. We all played in the pool for a good two hours, then I got tired so me and Adrien decided to head back to the room leaving Alya and Nino the pool. "Bye Alya see you at breakfast at ten? " I asked her she gave me a thumbs up for she was making out with Nino. There position looked comfy. Nino was agenst the pool wall and Alya had her legs wrapped around his torso with her hands in his hair. " Those two I swear." I said to no one.
" Yeah but their not as bad as us." Adrien said.
" Oh really?" I asked. We were in the bathroom hallway right inside the door from the pool. He did not care. He pushed me to the wall and kissed my neck, then my jaw, then finally my lips. I moaned involuntary. " Really he mutterd inbetween a kiss. I put my hands in his hair trying to pull him closer. I wanted him, we didn&apos;t have to worry about friends, parents, or poperosty.
" I love you so much Mari, not because your ladybug but because you are you, passionate, kind, brave, loving, talented, and more." He told me.
" And I you my kitty you are everything I could ever ask for and more." I tell him. That&apos;s when he got down on one knee and took something out of his pocket. 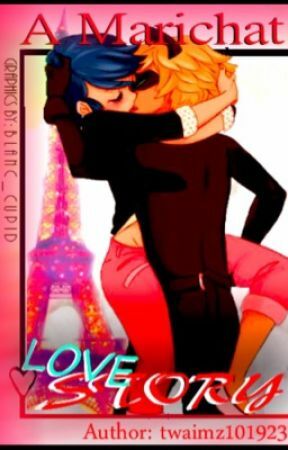 "Marinette Dupain- Cheng, you are the love of my life. I know we are only in our third to last year of high school but I promise to love you to the end of my days, you are the only one for me would you do me the extraordinary honer and marry me" he asked I looked down at his hand the ring was beautiful but I looked back up and focused on his eyes. His beautiful green eyes.
" Yes!" I said without hesitation. " Yes of course I will marry you." I told him. Then he got the brightest smile on his face and kissed me. The perfect kiss like from a fairy tale. I put in on were on my left hand on the finger next to my pinky where it would never come off. We feel asleep cuddled right next to each other in a peaceful slumber.
" Marinette honey it is 9:45 we have to meet Alya downstairs in fifteen minutes." Adrien told me. I sat up not happy about it. "I don&apos;t wanna though" I said in a grumpy voice, but got up anyway and got changed as did Adrien. That&apos;s when I remembered what happened last night and looked at my ring and blushed. "So it wasn&apos;t a dream." I said happily. "Nope I thought it was too." Adrien said as he came up behind me to give me a hug. " How did you sleep?" He asked me.
" Great!" I said. "Until you woke up." " Do not worry Adrien she is always like this, she hates mornings especially when she is having a good dream. 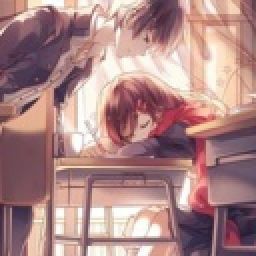 Now you two gotta go it is 9:57 and you still have to tell Alya and Nino." Tikki told us. We went downstairs to meet our doom. "Marinette" Alya said as we sat down her eyes locked on my ring I gave a squik. " What the hell is that!" She said pointing to my finger. Then Nino eyes filled her gaze and froze when he saw the ring. "Me and Mari are getting Married." Adrien said for me. Alya gawked and Nino choked on his food. "Dude" Nino said after he swallowed his food.